On Reorg Research, our subscribers are following over 100 bankruptcy dockets seamlessly and painlessly, with docket updates sent to them via email when a new item hits the bankruptcy court. Some funds are following just one or two dockets, and others are following as many as possible. Of particular note, our technology has the ability to allow certain firms to be the only client able to see a particular docket. If you find an off the run docket and request it, you will be the only firm getting docket updates and seeing that case load in near real time. With all that said, one thing that I will do every now and then, is share the most viewed dockets on Reorg Research for the past week. Most of these are from the large dockets which many funds are following on the site. Enjoy! Verified Statement of Kasowitz, Benson, Torres & Friedman LLP Pursuant to Federal Rule of Bankruptcy Procedure 2019 filed by Daniel A. Fliman on behalf of George Karfunkel, Marneu Holding Co., Moses Marx, Momar Corporation, United Equities Commodities Company. This filing, shows that Moses Marx, somewhat of a legend in the distressed world, and George Karfunkel, notable investor and board member of Amtrust Financial (and former owner of the American Stock Transfer & Trust Company, LLC) bought a significant position in EK's 2017 and 2018 notes (over $250M notional worth of bonds). It remains to be seen if their presence will change the direction of the case. For all those involved in the Turnaround Management Association, I will be at the TMA Event tonight (http://www.turnaround.org/Events/Calendar.aspx?objectID=2801) - if you will be around or want to meet up, shoot me an email: hunter [at] distressed-debt-investing [dot] com. Yesterday, Oaktree Capital's Founder & Chairman Howard Mark, released a letter to clients entitled "The Outlook for Equities." You can find the document embedded below. the third, when everyone's sure things will get better forever." "So now we have a somewhat improved fundamental environment, a generally more optimistic group of investors, and stock prices that are a fair bit higher. No one should say the likelihood of improvement is entirely unrecognized today, as would have to be the case for this to still be stage one. I think the existence of improvement is generally accepted, but that acceptance is neither extremely widespread nor terribly overdone. Thus I’d say we’re somewhere in the first half of stage two. Pessimists no longer control market prices, but certainly neither have carefree optimists taken over"
"But I like to enumerate the pros and cons and try to put them in perspective, as much as I like skewering excessive generalizations and pat pronouncements. Of course, doing that isn't enough. I feel I should come down on one side or the other. Thus I’m quite comfortable imagining a few years of equity performance that provide a pleasant surprise relative to what I think is the prevailing expectation of 6% or so per year. And if I'm wrong - if there is no rotation from fixed income to stocks – I'm not that worried that I'll end up with great regret over having failed to pile into T-bills yielding zero or the 10-year note guaranteeing 2.0%. When attitudes are moderate and allocations are low, like I feel is currently the case with equities, there‟s little likelihood of investing being a big mistake. And when interest rates are among the lowest in history, it would take deflation, depression or calamity to make failing to invest in Treasurys and high grade bonds a serious omission." My grandfather was a barber for his entire life. He started cutting hair when he was 15 years old with some of his older brothers to pay for food and clothing for their younger siblings three states away. His knowledge of the market ends with dollar cost averaging index funds in his IRA his entire life. In 1999, he asked me about a particular stock. A dot com stock. A customer had given him a tip on a high flying tech start-up and he asked me if I should invest in it. My grandfather, at this point, had lived over 70 years of his life and never once invested in an individual security and now he wanted to invest in a company at infinity multipe of sales because...you know, there were no sales. I told him it was a terrible idea and he shouldn't do it. He did it and plowed $5,000 or to him 250 haircuts into the stock. The stock went to zero in 3 years. "280 stocks hitting 52 week highs, 3 hitting the lows"
The problem with this is that the end of stage 4-stage 5 is painfully parabolic. As I like to say it "And then things just get crazy." Things here is a euphemism for market behaviors. My grandfather buying stock in 1999 is a crazy thing. When CLF traded to 120 in June 2008. When new home construction was increasingly exponentially. Etc. The scary part about being a value investor, and many of the great value investors testify this from the 1999-2000 period (when Julian Robertson packed it up), is those parabolic movements against them are painful from a portfolio and a business perspective. Its ok to underperform some months here and there by a reasonable margin, but when you are underperforming by 300-500 bps on a monthly basis when growth is the go - it hurts. Value investors are always early. The reason is that the herd that follows us lags in such a greater size relative to the intelligence ones. Intelligent investors get out in month 1, and then 200 investors get out in month 6. In those interim months, there are still people GETTING IN and frankly annoying value investors who scratch their head and say "What in God's name are people thinking out there?" Is credit again at the "And then things just get crazy." stage? It's probably the crazies thing out there right now but we've yet to see that parabolic movement where 95% those that are buying knows there's a strong chance this will end badly. The huge M&A push has yet to happen despite big piles of cash at private equity funds. 2nd lien dividend deals are out there (more so holdco dividend deals) but only for high quality borrowers. Growth is outperforming, but only in the last 6 weeks. As some of you saw, Reorg Research was publicly announced earlier this week. It's a project I've been working on for over a year and its been amazing seeing the response from the distressed community. 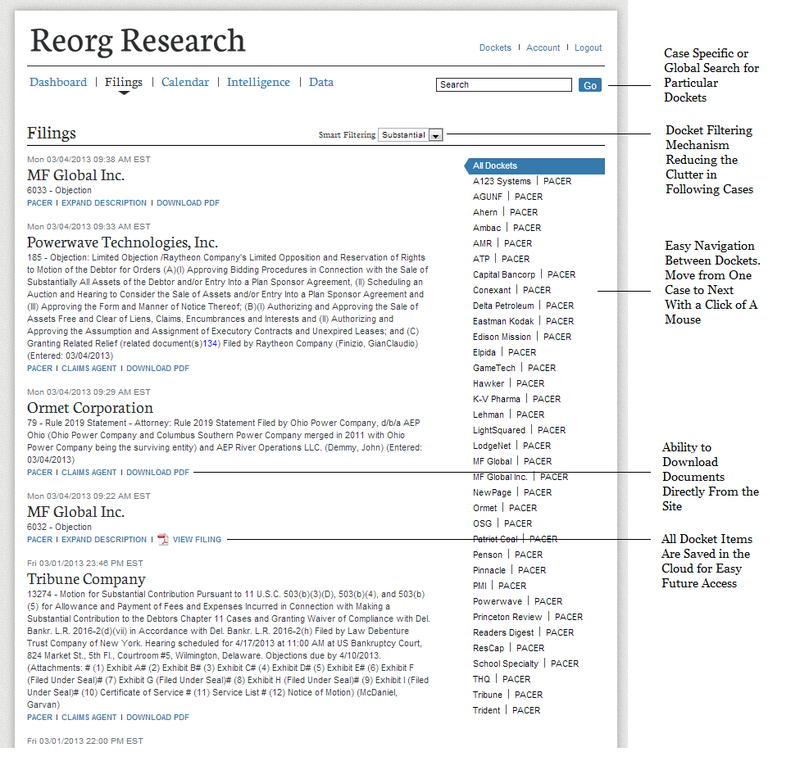 In addition to a revolutionary technology and data offering that is changing the way distressed debt research is done on a daily basis (whether it be hedge fund analysts and PMs, investment bankers, desk analysts, or law associates), Reorg Research, in the future, will be offering an incredibly insightful and timely intelligence product on distressed situations, in and out of the court. This isn't just the information you find from other providers of distressed news. Instead, I plan to offer something completely unique in the industry that will be enormously beneficial to our subscriber base. To that end, I am looking for one or two especially talented bankruptcy reporters to join the company. This is an opportunity for an enterprising reporter to get in on the ground floor of a financial media startup already with a large following and unique position within the marketplace. The successful candidate will work alongside a mix of distressed analysts and journalists with years of experience reporting and working in the restructuring. We’re looking for a dogged reporter with proven skills and working knowledge of the bankruptcy space. Most of the work will include hitting the phone to develop and maintain relationships with professionals across various business disciplines. Significant time will be spent following the bankruptcy docket of companies in your coverage and reporting/synthesizing bankruptcy filings alongside financial and legal professionals to determine trading and process implications. It will also entail listening in to court cases and reporting in real-time on contentious and dramatic bankruptcy proceedings.This position is perfect for a journalists looking to move to a research analyst role. This is a full-time salaried position with benefits and definite room for advancement as the company grows. Cancer treatment center operator Oncure Medical is weighing its options including a sale of the company, a sale of certain assets, or a debt restructuring leading up to a May interest payment, according to sources. Jefferies is advising the company while GLC Advisors has been representing bondholders since late last year to work on a solution, according to multiple sources. Professionals following the credit say bondholders could get better value in sale of the company, though it’s uncertain which strategic is poised to make such an acquisition. A debt-for-equity restructuring could also be a solution if a buyer does not come forward, sources have speculated. Oncure’s distressed issue of $210 million issue of 11.75% notes last traded at 48 cents on the dollar, according to trade data, and has been under pressure since 12 months ago, when the market started to digest the fact reimbursement cuts that were coming for radiation oncology. The bonds were trading in the mid-80s early 2012, but by March were in the 60s. Later on July 6, Centers for Medicare and Medicaid Services proposed an aggregate payment reduction of 15% for radiation oncology. The eventual cut effective Jan. 1 was 7%, according to the CMS report. Oncure signed a supplemental indenture so they don’t have to publicly report, as the company hasn’t put out a quarterly report since August for its six months ended June 30. Moody’s withdrew its rating Jan. 28 when the notes and corporate rating was a Caa3 and high probability of default. On Sept. 20, Standard & Poor's Ratings withdrew its rating, including it B- corporate at the company’s request. Even by the time of its last financial disclosure, Oncure’s losses were increasing, with a $5.8 million loss for the six months ended June 30, versus $4 million the same period year prior. OnCure, a subsidiary of Oncure Holdings, operates radiation oncology treatment centers for cancer patients at 37 centers throughout California, Florida and Indiana. Details about the upcoming financing for McGraw-Hill Education’s buyout by Apollo Global Management could place pressure on Cengage’s capital structure, according to sources. The financing, which consists of a $1 billion bond, a $560 million term loan and a $240 million revolver – and now $950 million in equity – now completely excludes the K-12 business, according to sources. There is no claim on that business, multiple sources said, and also the purchase price will solely be based on the higher education business. The pricing on the TL is L+650-800 with a 1.25% LIBOR floor and a 98 OID, and the revolver has a 99 OID, according to details presented on the call. The K-12 portion will have its own cap structure, according to sources that were on the bank meeting call yesterday, which might be some asset-backed revolver, and new investors could possibly purchase equity in that separate business along with Apollo. Cengage was mentioned frequently on the bank call from a competition standpoint, though there was nothing explicitly mentioned about any partnership or acquisition that could happen with the businesses - and idea debt investors have floated because Apollo also owns a portion of Cengage’s 12% notes. Cengage’s fate remains closely followed by distressed debt investors, and not without some head-scratching of late. The company’s bank debt took a dive prior to earnings being released as market participants feared poor results for the quarter ending Dec. 31. And those results were indeed poor as the company disclosed decreasing cash and cash equivalents of $33.5 million as of Dec. 31, down from $137 million at the same point year-prior, and adjusted EBITDA of $145.1 million for quarter, down 17% compared with the same quarter year-prior. Yet some of the developments were positive, which resulted in a relief rally in both the bank debt and 144A paper. Shortly after the Wall Street Journal reported last week that the company was going to hire – but had not yet hired – Alvarez & Marsal for restructuring options. Financial sponsors Apax Partners have been snapping up the company’s first-lien debt, the company disclosed in its latest results: during the “three and six months ended December 31, 2012, funds advised by Apax that had previously invested in our equity made substantial purchases of our outstanding debt at a discount,” according to the note. But it’s not certain if Apax has been doing this in order to retain control in an in-court or out-of-court restructuring. Apax, along with OMERS, purchased Cengage in July 2007 for $7.3 billion from Thomson Reuters, a deal that included about $5.6 billion in debt. Yet the owners have not been able to make any money on the acquisition except management fees, not being able to take out a dividend since that time. It appeared the backers were trying to extend their optionality in July, when JP Morgan ran an exchange for Cengage in a deal privately negotiated between the company and some of the larger notholders including Apollo. The exchange put in new 12% 144A secured notes due 2019, effectively subordinating the remaining 10.5% notes due 2015, and leaving the company with no ability under its senior secured leverage ratio to incur any additional first- or second-lien debt. Sources at the time noted those who got left out of the exchange were left with less valuable debt. This allowed Apax to keep their options open to address the remaining maturities while hoping for an improvement. However, since that improvement did not materialize, both notes have become severely discounted with the 10.5% notes quoted in the 23 context and the 12% notes at 33.5. The non-extended term loan was last quoted in a 78/79 context according to sources, while the extended portion is in the low to mid-70s. The cap structure includes $1.527 billion on the 2014 term loan at L+225, $1.29 billion on the extended portion due 2017 at L+550; $551.2 million on the incremental term loan; $725 million in 11.5% senior secured First Lien Notes due 2020 725 million, $710 million in 12% Senior Secured Second Lien Notes due 2019, $328.8 million in 10.5% unsecured notes due 2015; $132 million in 13.25% subordinated discount notes due 2015; and $66.2 million 13.75% PIK notes due 2015 for a total of $5.36 billion, as of Dec. 31, according to the company. Gatehouse Media management has been giving indications that “going concern” language is unlikely in the 10K set to be filed tomorrow, according to sources. If so, investors in deeply discounted $1.18 billion in bank debt may have to wait another year for a trigger to get return in a restructuring scenario. Also, tomorrow, investors will look to see how much Fortress Investment Group's funds – which also own 39.6% of the common stock – have increased on their holdings of $124 million of the term debt last disclosed Sept. 30, according to financial filings. Fortress had been snapping up more of the term loan in secondary purchases since the last quarter, according to sources. Sources put the increased position of the distressed investing private equity giant at possibly a “significant” increase to its previously disclosed holding. Funds of institutional investors Third Avenue Management, Eaton Vance, Neuberger Berman Management, Invesco, and Putnam owned smaller portions of the bank debt through the end of 2012, according to recent SEC disclosures, while additional holders had recently included GoldenTree Asset Management – once the largest holder - GE Capital, Ares and KKR, according to sources. Under the company’s credit agreement “any going concern” or similar language is considered an event of default. In such a scenario the company would have 30 days to cure that default, according to the credit agreement. On this uncertainty, about $30 million to $40 million of the term debt has traded down from 37 to where it is now quoted at 32/33 since an uncharacteristic filing of preliminary results, according to sources. GateHouse’s capital structure was put in place in 2007, comprising a $690 million term loan and a $250 million delayed-draw term loan at L+200, a $275 million incremental term loan at L+225 and a revolver. For the fourth quarter, Gatehouse expects revenues of about $125.6 million and adjusted EBITDA of $22.3 million to $23.3 million, according to its preliminary results, both down compared with $144.4 million in revenue and $32.9 million in EBITDA the same quarter from the previous year. For year-end Adjusted EBITDA of $80 million to $81 million would make the debt-to-EBITDA ratio would be nearly 15x. Prior to the Feb. 11 announcement, Gatehouse had never given preliminary results before. The company felt compelled to do so because of some additional difficulties that it had experienced throughout the quarter it felt might have impacted results. The company wrote in the preliminary results that the fourth quarter declines were “slightly worse” than recent quarterly reports due to Massachusetts legislation slowing the foreclosure process leading to large delays in the timing of foreclosure revenues, a soft economic climate for small businesses due to fiscal cliff issues pulling back on advertising spend and increased sales force hiring and training to ramp up digital service products. Ernst & Young LLP is the company’s independent registered public accounting firm for the year ending December 30, 2012. Moelis & Co. and Milbank, Tweed, Hadley & McCloy LLP have been representing lenders and agent Gleacher in relation to the deal. For as long as I can remember, research and analysis of distressed debt has been an archaic process involving tedious and manual work, pulling information from a variety of disparate, untimely and incomplete sources. Thousands upon thousands of hours are wasted by the buy side and sell side searching and locating specific dockets in numerous cases which currently entails a painful process where oftentimes important updates to bankruptcy cases are missed. Time that should be spent analyzing is instead time spent wasted looking for answers. "I check Pacer and various Court Dockets so many times it makes me sick: No seriously. It is such a tedious process. If anyone knows a way to automate this or wants to start a company that automates this with me, let me know. This is important because rulings move markets, new information from court filings move markets, you want to be ahead of the news." I searched far and wide for solutions to my problems. The option set was limited at best, and most were very heavy modules targeted to the legal community. None were designed with a finance professional in mind: what information we need, when we need, how we would use it. 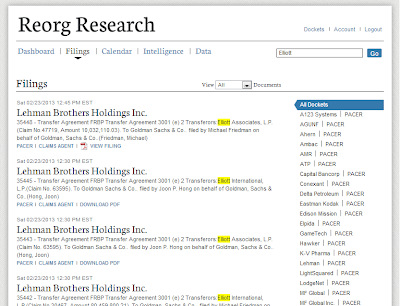 I encourage all who are interested in testing the site to request a trial on the site here: Reorg Research Trial Page. 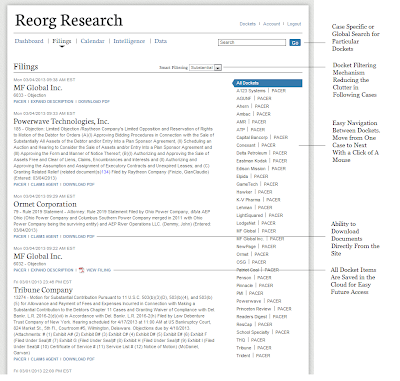 What are Some of the Features of Reorg Research Docket Product? Or maybe you want to do a fee comp study for an engagement you are working on as banker? We can do that in minutes. You can search across all cases or just one case at a time. You will be able to find information faster than ever. 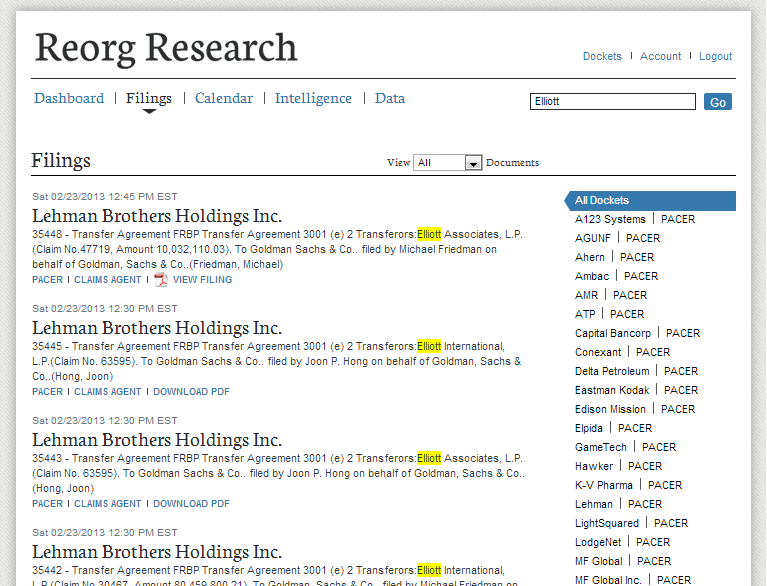 Are you a hedge fund that wants to follow a docket but doesn't want others to see it on Reorg Research? I am fulfilling the request daily for funds. With the ability to track SO many case in one spot, hedge funds are able to leverage their analysts better and look at more opportunities in smaller cases. As we move through the first quarter, Reorg Research's services and offering will be expanding: As some of you saw, I have been actively hiring distressed debt analysts and reporters to cover situations in and out of the court room. Our first full time reporter, Max Frumes, was most recently at S&P LCD covering pre-bankruptcy situations. Max will be out there breaking stories in the pre bankruptcy space and most of his content will be going on Reorg Research (he's writing there as we speak). In addition to reporting, me and my team of analysts will be providing opinions on distressed situations, tear sheets so you can quickly get up to speed on cases, real time alerts on court proceedings and important decisions, legal analysis on vital bankruptcy dockets and the potential affects on securities valuation, and a portfolio manager summary that highlights the main drivers of value in a case. For questions on Reorg Research, please reach out to me with an email or a call. I am actively visiting clients or talking with them on the phone on a daily basis and walking them through some of the features and benefits on the site. Simply put: Reorg Research is a game changer for professionals in the distressed debt space. We are saving our subscribers precious time and money and streamlining their research process in revolutionary ways. Distressed Debt Investing has written multiple times on the OSG case. The case began heating up again when the IRS filed their tax claim in the case (priority claim for $463,013,177.63). Since then many parties have discussed what the ultimate tax issues will play out in the case. More information may come out during a bankruptcy hearing on March 5th where contested matters include both application for entries for an order for retention of PWC and Deloitte as Independent Audtior, Accountant, and Tax Advisor and Tax Advisors respectively to the company (responses have been received by the indenture trustee, the U.S. trustee, and the Official Committe). And today a notice of withdrawal for no objection also hit the docket in regards to the employment of PWC - so things could get interesting. The objection from Wilmington Trust (Docket item 672) is actually a pretty good read. This is one of the better quotes: "Although the Debtors seek to retain Deloitte Tax LLP (“Deloitte”) as tax advisors to the Debtors and apparently intend to transition the Debtors’ tax work from PWC to Deloitte, the Debtors nevertheless fail to explain in their Motion why it is appropriate for them to retain as their auditor the very same auditors who audited the financial statements of the Debtors which have to be restated." Solid burn. The objection goes on to note that PWC may not be a disinterested party according to the code, a professional firm can only be retained if they are 'disinterested'). process of reviewing a tax issue arising from the fact that OSG is domiciled in the United States but has substantial international operations, in relation to the interpretation of certain provisions contained in OSG’s loan agreements (the “International Tax Issues”)." With a huge penalty apparently from the 2010 returns...Who is looking at those returns? Also - how is it possible that 2010 and 2011 penalties are identical when net income is all over the place for both foreign and domestic operations of OSG? Does it have something to do with the guarantee side of the bank debt? I know many funds have gone out of their way to figure out what the tax penalty entails as it is a huge swing factor for bonds at issued out of the holding company. To me the play all along has been bank debt holders (DK, GS, and a few other prominent ones) to do a rights offering to pay down European banks holding this bank debt on their book (probably marked too high), and cram down the bonds. But that will be a lot harder to do if the tax claims in much less or even pari with the bonds. I'll add some more information after the hearing on the 5th.